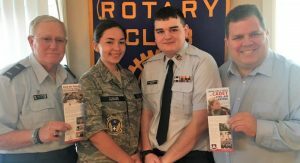 FULTON – At a recent Fulton Sunrise Rotary meeting, Lt. Robert Dalton, Commander of New York 408 Civil Air Patrol and two cadets, Jonathon Kobelion and Senneyeawauss Clinard, presented an overview of the Civil Air Patrol organization located at the Oswego County Airport. From left: Lt. Robert Dalton, Cadet Senneyeawauss Clinard, Cadet Jonathon Kobelion and Sunrise Rotary President Dan Farfaglia. It is under the United States Air Force and was formed 75 years ago based on the premise to learn, lead, and serve. The cadets can join as young as 12 years old. For more information, contact Lt. Dalton at 315-440-4986 or GoCivilAirPatrol.com.